Now that I’ve overcome a lifelong pressure cooker phobia resulting from the applesauce incident, I prefer cooking dried beans to buying tinned. It’s more work, but with recipes like tonno e fagioli, the difference in texture and taste is worth the extra effort. I like to season the cooked beans while warm, so they can absorb flavour as they cool. If you don’t have time to cook dried beans, heating tinned beans in their liquid, draining and seasoning them is an option. If using dried beans, rinse and pick over the beans, removing any broken ones. Soak, drain and cook in fresh, unsalted water to which a bay leaf has been added. When tender, drain the beans and season with salt, pepper and olive oil. Allow to cool. If using tinned beans, empty the beans and their liquid into a pot. Bring to the boil, drain, and season with salt, pepper and olive oil. Allow to cool. While the beans are cooling, soak the onions in salted water for ten minutes to soften their flavour. Drain and pat dry. 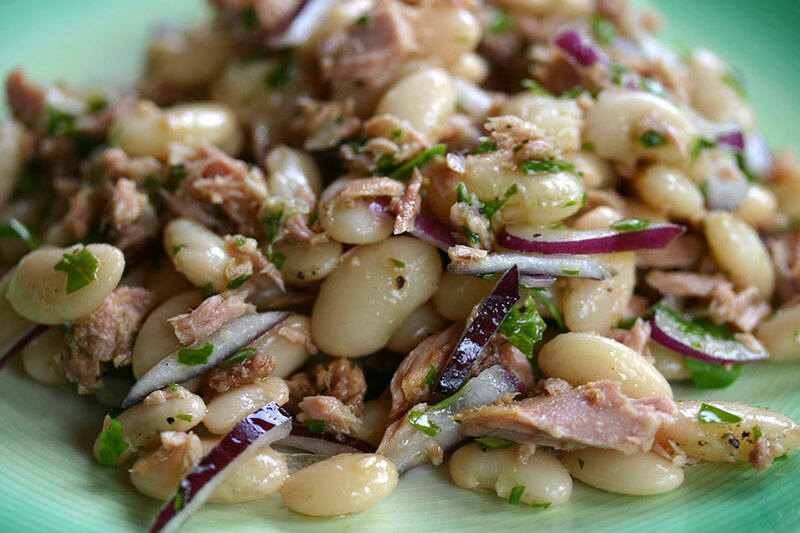 In a serving bowl, combine the beans, onion, tuna and parsley. Mix well, adjust the seasoning and olive oil if needed.